New innovations allowed Tohatsu to introduce a new Electronic Fuel Injection (EFI) four stroke outboard to its lineup; meet the 9.9hp EFI Sport. The lightest weight outboard in its class features exceptional torque and top end speed so you can get where you need to go in a flash. The battery-less EFI system on the MFS9.9 offers superior starting performance as compared to previous carbureted models. Also, with an EFI outboard, no choke is required during start up and you'll notice smooth, crisp acceleration throughout all RPM ranges. We set out to completely redesign an already top performing motor, and well exceeded that goal. Tohatsu's new 9.9 EFI Sport accepts top honors for top speed, fuel consumption at idle and most importantly fuel efficiency at wide open throttle. Our fuel efficiency is so much better than the competition, users can go up to 50% farther on less fuel***. So what are you waiting for, get a 9.9hp EFI Sport and Feel The Wind™. The 9.9hp EFI comes in three available shaft lengths, 15", 20", and 25". 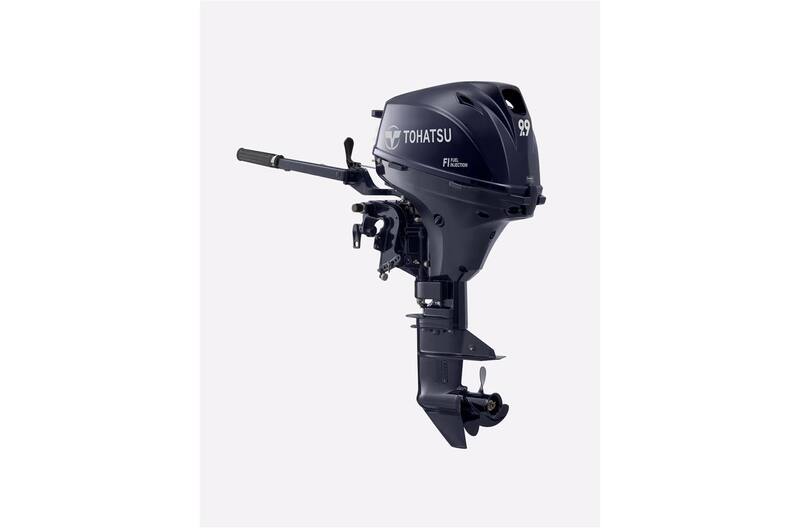 Tohatsu's 9.9 hp has a fantastic option for boaters: Power Tilt! Our 9.9hp EFI engine has an added feature on its power tilt models, a 4 blade high thrust propeller that sets it miles apart from the competition. You can't beat the power and reliability of Tohatsu's 9.9hp and now with electronic fuel injection and a power tilt option, why would you try anything else?